What is the Administrative Procedure Act (APA)? Can I send comments to OAL about a regulation that OAL is reviewing or other proposed regulations? Can OAL give me legal advice? What are the California Code of Regulations, the California Code of Regulations Supplement, and the California Regulatory Notice Register? Where can I find the California Code of Regulations (CCR)? Where can I find the California Code of Regulations Supplement (Register)? Where can I find the California Regulatory Notice Register? How does OAL count time for its review period? 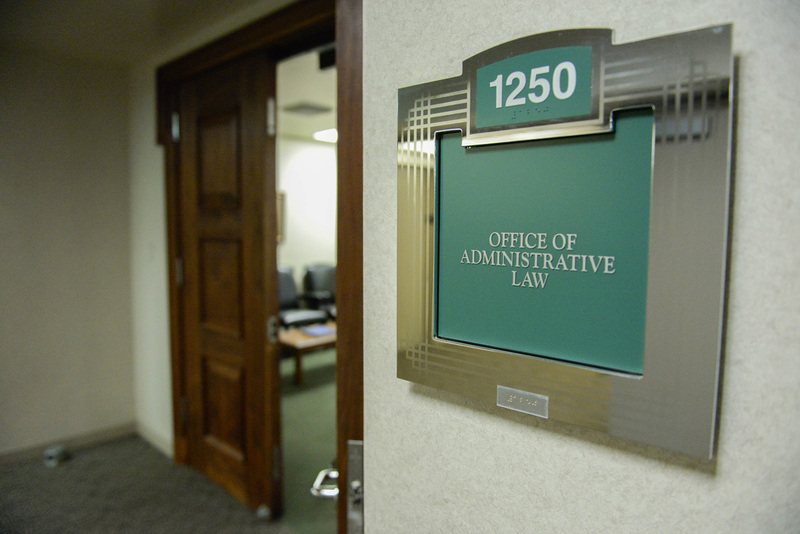 Is the Office of Administrative Law (OAL) the same as the Office of Administrative Hearings (OAH)? What are “administrative” or “rulemaking” agencies? Can I ask for a change in an agency’s regulations? How? What happens after I have petitioned an agency, as outlined above? How do I find a past version of a regulation? Chapter 3.5 of the APA establishes rulemaking procedures and standards for state agencies in California. The requirements set forth in the APA are designed to provide the public with a meaningful opportunity to participate in the adoption of state regulations and to ensure that regulations are clear, necessary and legally valid. The APA is found in the California Government Code, commencing with section 11340. State regulations must also be adopted in compliance with regulations adopted by OAL (California Code of Regulations, title 1, sections 1-120). Generally, there are two types of rulemaking procedures that a state agency can pursue: regular or emergency. The regular rulemaking process requires that a state agency meet certain public hearing and notice requirements. The Emergency Rulemaking Process has different requirements but generally include a brief public notice period, a brief public comment period, review by OAL and an OAL decision. In addition, some agencies have requirements related to regular or emergency rulemakings that are unique to that particular agency. With the passage of Assembly Bill 1302 (Statutes of 2006, chapter 713), the APA standards and procedures for emergency regulations were revised effective January 1, 2007. For more on the emergency rulemaking process, see OAL’s Emergency Rulemaking Process page. Or, if you have specific questions about the emergency regulation process, contact the OAL Reference Attorney at (916) 323-6815 or at staff@oal.ca.gov. No. OAL does not provide legal advice. OAL can answer questions on the statutes and regulations governing California rulemakings (see Government Code section 11340 et seq. and Title 1, CCR, section 1 et seq.) and the status of regulations filed with OAL. For information on the APA, OAL’s regulations, or the status of regulations filed with OAL, you may contact us at staff@oal.ca.gov or (916) 323-6815. We cannot answer questions about legal matters unrelated to the APA. For help with legal problems, please contact your local Bar Association’s lawyer referral service or the State Bar Association. The Sacramento County Bar Association’s number for referral to an attorney is (916) 564-6707. The Office of Administrative Law (OAL) publishes three primary regulatory publications for California: (1) the California Code of Regulations (CCR) ; (2) the California Code of Regulations Supplement (CCR Supplement); and (3) the California Regulatory Notice Register (Notice Register). The CCR contains regulations duly adopted pursuant to the Administrative Procedure Act (APA) by California state agencies. Generally speaking, after OAL approves a proposed regulation adopted by a state agency, it then files the regulation with the Secretary of State. The hard copy publication of the CCR is updated weekly through the publication of the CCR Supplement (Register). The CCR Supplement (Register) is commonly and historically referred to as the “Register.” The online publication of the CCR is updated each week electronically.The Notice Register is the weekly publication of state agencies’ Notices of Adoption, Amendment, or Repeal of regulations to the CCR. The Notice Register also contains other information on current state agencies’ rulemaking activities. The CCR is available online at http://ccr.oal.ca.gov/, the offices of County Clerks, County Law Libraries, and state depository libraries. It is available in loose-leaf form from the publisher, Barclays, a division of Thomson-Reuters. For information, contact Barclays at 1-800-888-3600. The California State Law Library houses a collection of past CCR Supplements (Registers) going back to 1945 in a variety of media formats (microfiche, hard copy). OAL also keeps a set of CCR Supplements (Registers) but does not have them in the variety of media formats as does the State Library and is not able to offer library or research services to the public. Library staff can assist with research issues. Please contact the State Law Library at:Stanley Mosk Library and Courts Building Witkin State Law Library of California 914 Capitol Mall, 3rd Floor Sacramento, California 95814 (916) 654-0185 Fax: (916) 654-2039 Email: csllaw@library.ca.gov. OAL’s California Regulatory Notice Register (“Notice Register”) page provides the online weekly Notice Register, as well subscription information and an archive going back several years. No. OAL is not the same as OAH. OAL carries out the rulemaking part of the Administrative Procedure Act (APA) which allows executive branch state agencies to adopt rules and regulations. OAH, in the Department of General Services, is a quasi-judicial tribunal that hears administrative disputes. OAH provides both adjudication and alternative dispute resolution services for proceedings, such as license revocation hearings, that follow APA hearing procedures. OAL does not conduct administrative hearings. Like the United States government, the government of California is divided into three separate and distinct branches or departments–the legislative, executive, and judicial. The Legislature is made up of the Senate and the Assembly whose members are elected by the citizens of the State. The judiciary includes the court system, including the trial courts, Courts of Appeal, and the California Supreme Court.The California Constitution and the statutes enacted by the Legislature create the various state agencies, departments, offices, commissions, boards, and so on to carry out the laws found in statute. These “state agencies” have and exercise the power granted to them by both statutes and the California Constitution. These powers often include “rulemaking” or the making of rules and regulations in order to carry out their duties. No. OAL does not review statutes enacted by the Legislature. By law, the agency must notify you in writing of the receipt and any denial of the petition within 30 calendar days. Any denial must be in writing and include the reasons the agency reached its decision. If the agency does not deny the petition it must schedule the matter for a public hearing. Any decision denying or granting a petition, in whole or in part, must be in writing and transmitted to OAL for publication in the Notice Register. The agency may also take any other action it may determine necessary by the petition, but is required to notify the petitioner in writing of any such action. See Government Code sections 11340.6 and 11340.7, which describe the complete petition process. To find a past version of a regulation or research its history, please see Finding Past Versions of a Regulation.